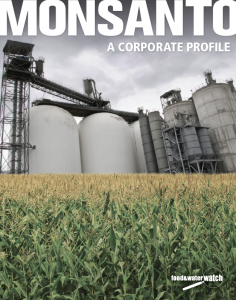 Earlier today, the national organization Food & Water Watch released a new report on the multinational corporate Monsanto. The new report provides an overview of the biotechnology giant that now holds 1,676 patents on seeds, plants and other agricultural applications. Monsanto’s products are grown on over 282 million acres worldwide, including 40 percent of all U.S. crop acreage. The report outlines Monsanto’s history and its undue influence over lawmakers, regulators, academic research and consumers. 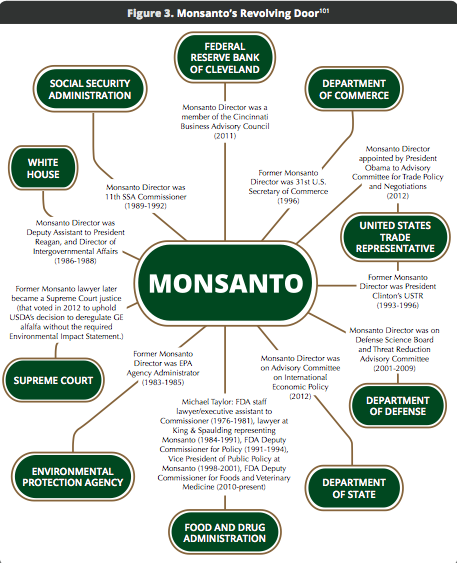 Monsanto: A Corporate Profile provides a deep-dive into Monsanto’s history as a heavy industrial chemical manufacturer; a reality at odds with the environmentally friendly, feed-the-world image that the company spends millions trying to convey. The report offers a timeline of milestones in the company’s history including chemical disasters, mergers and acquisitions, and the first genetically engineered plant cell. The 20-page report covers numerous aspects of the corporation, such its history, the tactics it uses to impose its will on the public, their global reach and the PR practices. 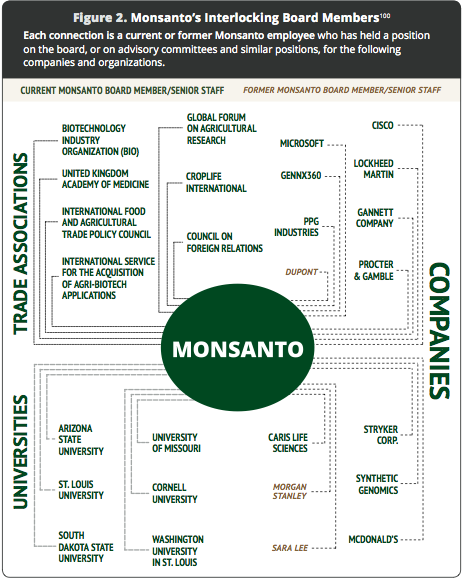 Other areas the report explores that this writer found valuable is Monsanto’s political influence with federal policy and the company’s relationship to other corporations, demonstrating an interlocking system of power, as you can see in the following graphics. Hey there…there is a national March Against Monsanto protest on May 25, and we are having a local one here in GR. Any way you can help us get the word out? Much appreciated! Facebook page is March Against Monsanto Grand Rapids. Thank you for the awesome site…..